The all-female kumina group of Port Morant, St. Thomas. 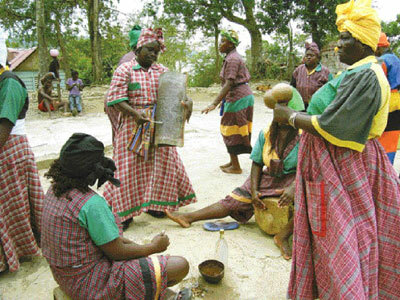 Persons who attend nine nights often mourn the dead with folk songs, playing the kyast (drum), pots, graters, shakers and other cultural items. Death rituals like those related to labour and delivery were not banned during slavery and so they served as a means of cultural preservation. Unlike birth rituals, however, although death rituals have also largely been replaced by Western conventions, some traditions remain strong. In addition, as with the birth of a child, death and burial are still ways of bringing family and friends together. Indeed today the use of new embalming technologies allows many funerals/wakes to be delayed until all family members can arrive on the island. These events can range from small to extremely large as they are also used to showcase the financial and social status of the deceased and his/her family. Today, Jamaican death rituals mix African and European cultural practices with Christianity. 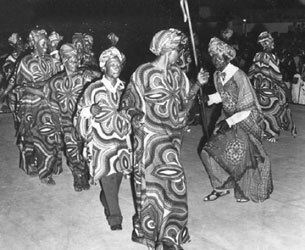 Christian hymns and references to the spirit's journey to heaven are intertwined with African rituals aimed at placating the dead spirit. Symbols of death include moths or birds flying into the sickroom or house where the dying person lies and birds singing late in the night. Red and white floral arrangements are also considered tokens of death's arrival. Many death rituals transcend race and class and are derived from African customs. These include ensuring that the corpse is taken from the house feet first, stopping the clocks, covering mirrors in the house, wearing black, white or purple and rearranging the furniture so that the ghost will not find the place familiar if it returns. Another African custom, still practised in some parts of Jamaica, is the passing of a young child over the dead person three times to prevent the spirit from causing any harm to them. The cause of death was of great interest to those left behind and traditionally some corpses were given knives, razors or money with orders to avenge a death believed to have been caused by witchcraft. The corpse might also have been given a horsewhip either a spirit to ride or kill the killer, or a broom tied in white cloth to sweep the yard clean. Other beliefs include the corpse getting heavier if standing before a door where a debt was owed, or if the dead was due to be buried in a place he/she did not want to go, as well as the coffin forcing the pallbearers to stop before the house of the killer and refusing to move at all. REVIVAL TIME: Kapo (with staff) and some of his members of the St. Michael Revival Group caught 'working the show'. It was important that the rituals were followed in a particular order so as not to offend the dead and ensure the spirit's safe journey back to God. In African belief the self has three components - the body, the spirit and the shadow or duppy. Once the body is dead and the spirit began his/her journey to God, the duppy or shadow could live on and wreak havoc for the living if not given due respect. Long ago, it was believed that the spirit would return to Africa and therefore sometimes messages were sent to loved ones in activities that occurred during the nine-day period which gave the living the time to ensure that the spirit understood that it should depart from its home. Technically, the nine night is the period of mourning after death that culminates in ceremonies involving food and dancing on the ninth night. Following Christian custom, the soul's ascent to Heaven is emphasised while African traditions call for more emphasis to be placed on placating the spirit of the dead person. Religious ceremonies tend to be staged first so as to ensure that the dead understands that it is time to leave his/her old home. If this is not done the spirit is said to haunt the living (Senior, 2003, p. 353). 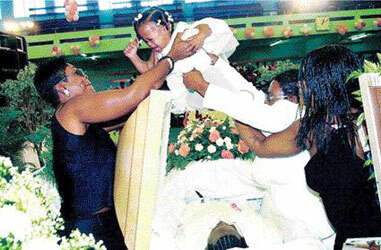 File photos - Mourners at notorious gangster Willie Haggart's funeral on May 8, 2001, pass a young child over the coffin three times to prevent the spirit from harming them. During the 17th and 18th centuries, burials occurred the same day for the day after due to the tropical climate and the fear of disease. During that time, however, it was rare for ministers to perform funerals. The plantation owner would say a few words over the body or simply read excerpts from the Bible. Large stone markers as well as tombs and church monuments record the lives of plantation owners while few markers exist for those of poor whites, indentured servants or slaves. Although slave cemeteries must have existed, the markers would most likely have been plants such as crotons and the coffee rose which symbolise everlasting life since they survive droughts. Peas and beans were also planted in the family plots to tie the duppies to the grave and prevent it from wandering around to haunt the living. No slave cemeteries have yet been found in Jamaica. Through the years, shells were used to mark the graves of poorer Jamaicans until those who could afford it could erect a tomb. This is why in some cases memorials for the dead were held up to a month following the actual death. For those Jamaicans who practise kumina, the tombing of a loved one occurred one year following his/her death and involved a significant rite. In general, however, certain protocols were followed for burial. When digging graves, for example, rum was poured into the ground to ask permission from the earth spirit. Graves were dug east to west and the body placed to face sunrise. Mourners would often take some dirt and with their backs turned to the grave throw it between their legs to prevent the dead from following them home. In addition, the deceased's personal belongings were also placed on the grave to pacify the dead person's spirit and prevent it from leaving the grave. These items were often broken in order to prevent more deaths in the family. Sources: Senior, O. (2003), The Encyclopedia of the Jamaican Heritage, Kingston: Twin Guinep Publishers.